With the arrival of Halloween, I thought I would say good-bye to Fall in my neck of the woods. Right from the comfort of my own yard. It's getting creepy around the ranch. And creepy to me isn't cute. You might think this little ghost gang is cute, but I think ghosts are creepy. Shock-tober wouldn't be complete without posting about our scarecrow. If you have been around Bliss Ranch for a couple years you have probably met him before. A few years ago, 8 apparently, in 2006 BB (Before Blogging), I decided to make a scarecrow using sheet rock mud and stuff from around the yard. 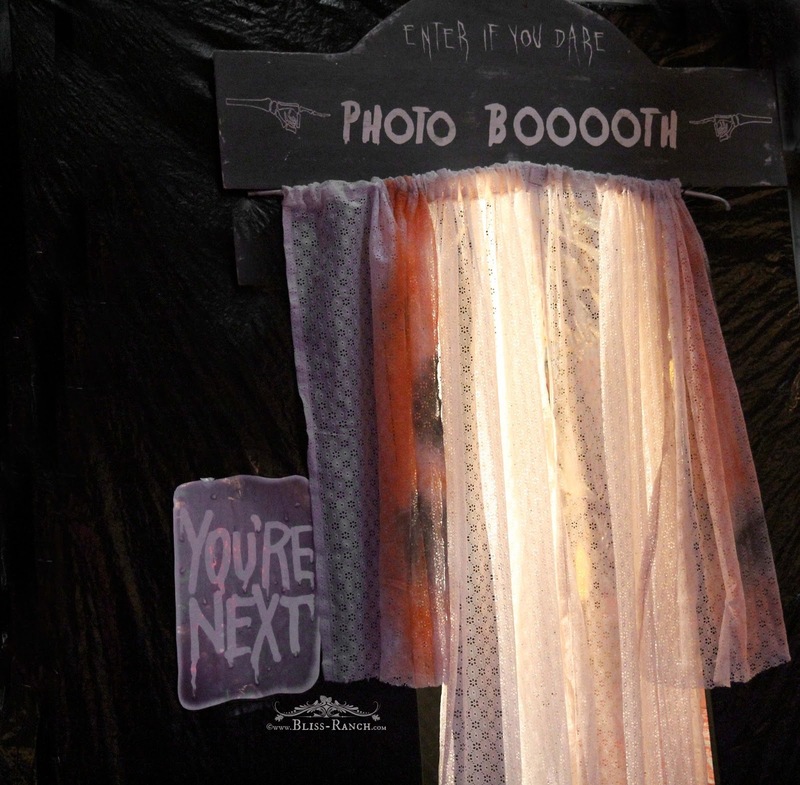 Last Halloween I got it in my head that I wanted to use my Ipad and create a photo booth for our Halloween party. We had enough on our party plate and I didn't want the build to be a big process. Basically what that means is if I want to get my way I better K.I.S.S. .... k.eep i.t s.imple s.tupid. My absolute favorite Halloween project that I have ever made are Haunted Portraits I spied from Tracy over at CrowsFeetChic. I've made two versions of these. The first version was inside the house for a mystery dinner party, the other was in the back shed for a large throw down the grog party. For both projects I intermingled photos of our friends with photos from the internet, all printed in black and white or sepia. Fall. I love it. Not just a little, a lot. I don't usually start to decorate till October, and when I do it normally has a spooky twist. All those years as a Halloween party hostess I guess. Over at Fox Hollow Cottage I spied a guest post from Shayna at The Wood Grain Cottage for some concrete pumpkins, and I knew right away I was gonna make some. Using quick set concrete was right up my alley since I now have three stone look walkways made using the stuff. These are my first victims. 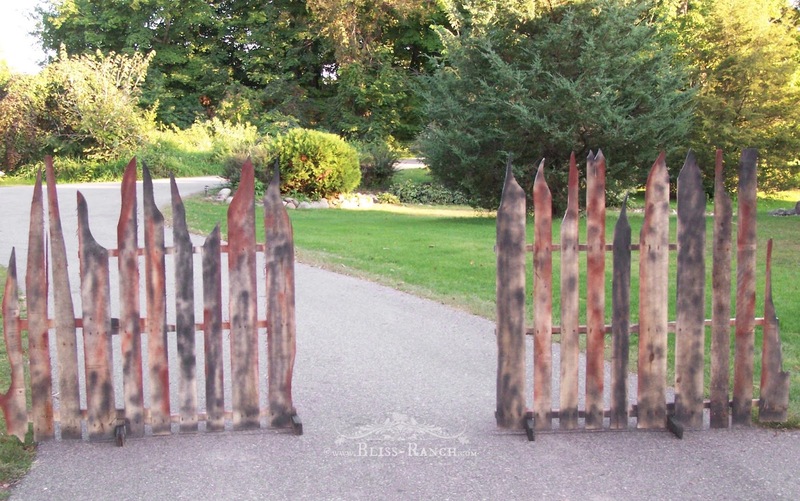 Give a man a couple chisels, the back side of a hammer, and two old wood pallets and in no time at all you can have a spooky fence for Halloween. You wanted a spooky fence right? I did. I needed it for a haunted trail. Now don't judge most of these photos too harshly. When they were taken, I didn't know I was ever going to have a blog and show them to people. Nor did I know that using old wood pallets was going to become all the rage 10 years later. This is the tale of pallets and days gone by many Octobers ago. 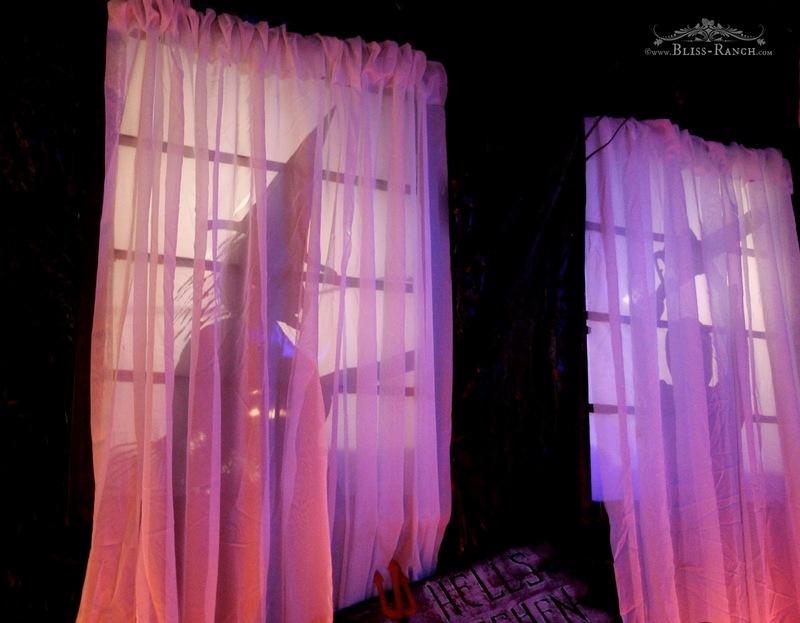 It's Shock-tober at Bliss Ranch, and that means highlight some of my favorite Halloween projects from around this haunted house. One dark and gloomy October day a few years back before the Bliss Ranch blog existed, I decided to make my version of Martha Stewart window silhouettes. I followed her tutorial here. Well, I kinda followed it. 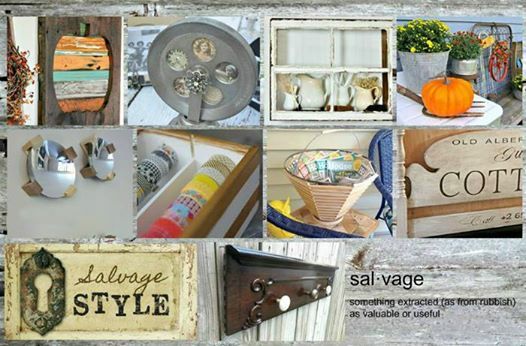 You wanna see some sweet salvage style stuff? Along with me are 8 other bloggers willing to show you their upcycled, repurposed, or trash to treasure projects and then at the bottom link up your projects because we all want to see what you've been creating. Project - is a vintage headboard I won at an auction for five buckaroonies. Kirby from Kirb Appeal and Andi from Delusions of Ingenuity, are now on the top of my list. You know what list that is right?.... 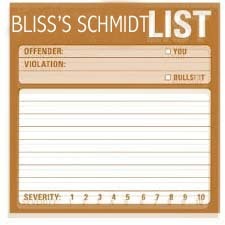 my schmidt list. Not because I don't like them, I do, they are a whole lotta funny. They are on the list because they've obviously got my number and know I won't say no. So, because I am such a gosh darn good sport, I'm going to answer 50 questions that I was tagged in....twice.... that have nothing to do with painting or recycling furniture. That is twice as in I was tagged twice. You're welcome - I won't be answering them twice. My birthday suit. With a jammies chaser.